Visit www.livebarn.com for more information. 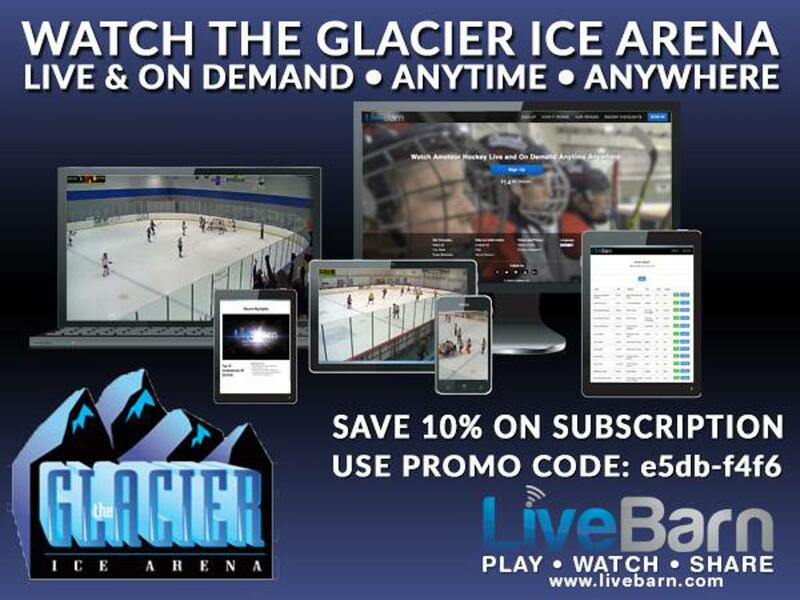 LiveBarn is available at Glacier Ice Arena! LiveBarn provides online broadcasts of youth and amateur sports at hundreds of venues across the US & Canada. Games are broadcast both Live and via On Demand replay. LiveBarn is available on a monthly subscription basis starting at $14.95/month. Use PROMO CODE: E5DB-F4F6 for a 10% discount. PLEASE NOTE: Hockey Refund Policy: If you opt to cancel an enrollment after registering for a hockey program, your account will be credited the amount of the refund minus a $25 processing fee. We offer Open Hockey times for Adults ONLY. All participants are required to wear full equipment and sign a waiver before playing. Our times vary during the summer months, so please call at the beginning of the week to find out the exact times.